Whoa Baby! That is the stuff Barbie’s dreams are made of. But $35 a pop is tad steep for el cheap-o frugal me. Next (and the reason for yesterday’s post) I added the DIY locker tags. 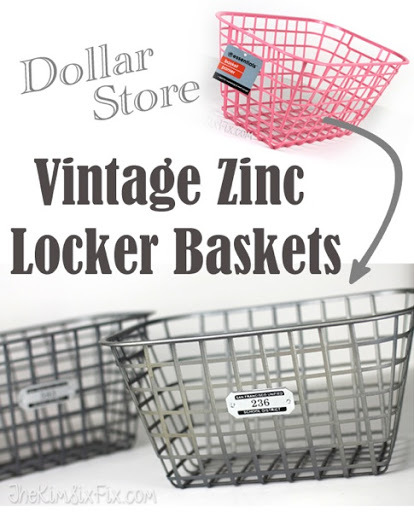 If you didn’t have an excuse to make a couple of sheet metal locker tags.. now you do: The final project cost less than $2 and unlike real wire baskets, there is no chance of snagging or poking or scratching. I added them to the built in shelves int he living room and unless you get up REEEEEALY close, you wouldn’t guess they were plastic. I haven’t figured out exactly what I’m going to put in them yet. I may find some old paperbacks, like the Ballard staging.. but for now I’m just enjoying looking at them empty!